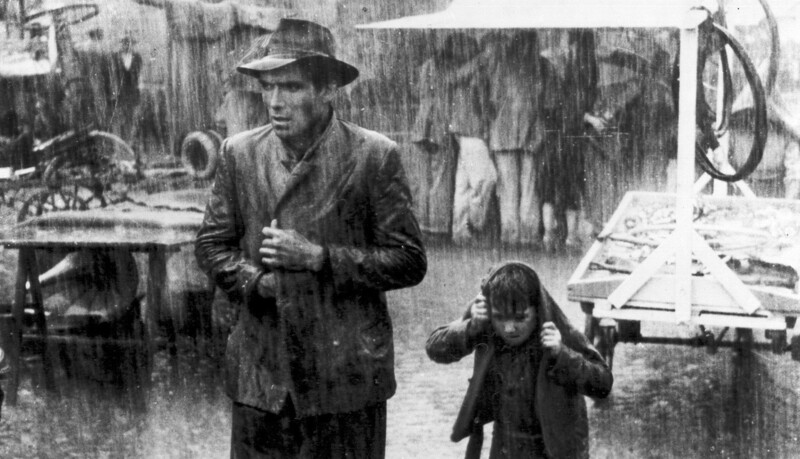 A touching tale of hardship and struggle, Bicycle Thieves is one of the most popular and well remembered films from the Italian Neorealist movement. I've never been a fan of Italian Neorealism (I often find it a bit too sleepy for my dumb, attention-starved brain), but I've always been fascinated by the issues they tackle (class, nationality, family). In Bicycle Thieves, I finally found those issues tackled in a way that was also entertaining to watch. A poor father named Antonio Ricci gets a job with one catch: he has to have a bicycle. Unfortunately, he just sold his bike to pay for food. So he and his wife agree to sell the sheets off their bed in order to buy it back. Not only is this moment a ruthless gut punch of an emotional blow, it highlights the discourse in the film surrounding work and the economy. Antonio needs his bike for his job, but unemployment is so rampant that much of the populace has turned to robbery as a last resort. But these robbers, as much as we might hate them, are just less fortunate incarnations of Atonio. Society is a cycle of joblessness brought on by the depth the jobless are forced into. This pattern leads back into the final moment of the film, where the theme of recurrent poverty comes full circle. 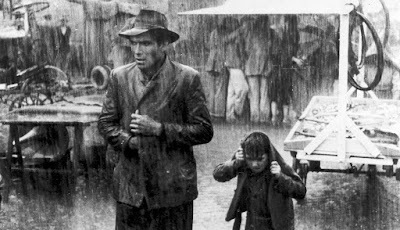 Without a more capable governing body (the police essentially blow off Antonio's complaint), Italy is descending into chaos, and Bicycle Thieves depicts the plight of the working class like no other. Italy was still recovering from World War II as well as the Italian Civil War, and the government was struggling to find its feet. The monarchy had just been abolished and a new republic established in its place. Bicycle Thieves is a depiction not of these changes directly, but of their indirect influence on the people. The fact that it is about the theft of a bicycle (whereas today we make movies about data and identity theft) gives a telling portrait of the state of affairs in Italy at the time. The country was fundamentally unstable, and this can be felt throughout the film in the anarchy of the employment office, the police station, the open market, and the very streets of Rome. The way Bicycle Thieves establishes the conflict surrounding Antonio's bike is excruciating in the best possible sense of the word. The amount of tension created when he leaves it in the street for a moment to check on his wife is almost unbearable. His family has sold the sheets off their bed to get it back, and even then they don't have enough money to feed themselves until he gets paid. If you've ever had to pay your own way through life (which, admittedly, I've only had to do recently), you'll immediately identify with his plight and start shouting at the screen whenever he leaves the bike alone. It is his only safety net in a violent world. This conflict also feeds into the film's incredible sense of drama. We understand how desperately Antonio needs his bicycle, so we feel for him when it's stolen. However, because of how well the film paints the backdrop of the world around him, we also understand how easy it would be for someone else to fall into the trap of becoming a thief. Both halves of the conflict are sympathetic and innately human. The thieves are still wrong for making the decision to become criminals, but because we understand the world they live in, we can sympathize with that decision. We can see ourselves in both the good and evil of the film, and that's the essence of true drama. 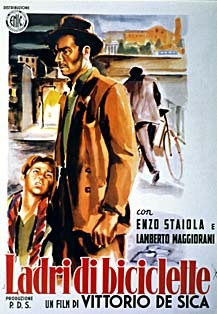 It's interesting to me that some sources translate the original Italian title, Ladri di bicyclette, as The Bicycle Thief (singular), instead of the literal translation Bicycle Thieves (plural). It's almost like someone decided that making the title plural might spoil the fact that Antonio Ricci becomes a bicycle thief himself, except that there are blatantly multiple people involved in the theft of his own bike before he becomes a thief himself. The plurality of the title is also necessary to the film's discussion of recurrent poverty, although that's probably not something the distributors care much about. As a singular title, however, the ending creates one of those great (albeit potentially cliched) reversals where we realize that Antonio was "the bicycle thief" all along. Anyway, clearly I've thought too much about this incredibly minor issue.